In my blog post on how to choose a laptop for your Virtual Assistant business, I mentioned that I use a Chromebook in addition to my main laptop. This interested quite a few of my readers and, because they wanted to know if a Chromebook was a viable alternative to a Windows laptop, I thought I’d tell you more about Chromebooks and how they work. 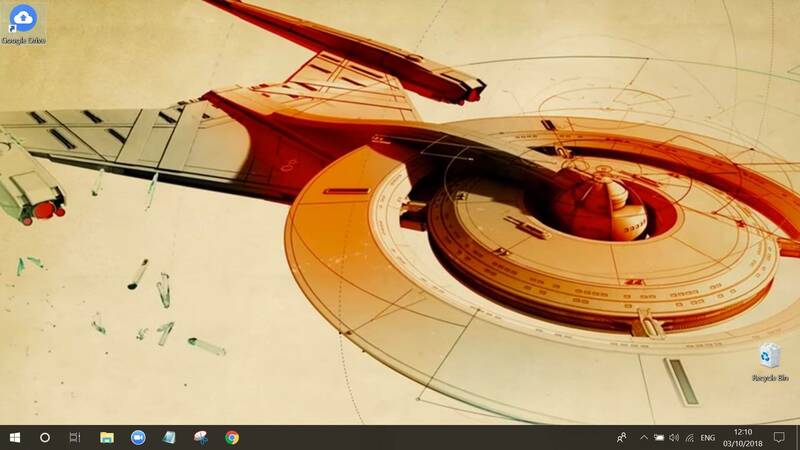 Below is a screenshot of the desktop of my Asus Aspire laptop. Notice anything unusual about it apart from the awesome pic of the USS Discovery? Like the fact there are only TWO icons?! My desktop is beautifully minimalist because I now work solely in the cloud and these are the only icons I need. In fact, my Chromebook’s desktop doesn’t have any icons. 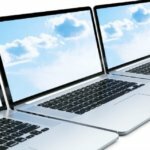 Previously, my Toshiba 2 Chromebook was just my backup and travel device in case anything happened to my Asus, but after a recent conversation with another business owner on disaster recovery and contingency and some further research into Chromebook advancements, I made the decision to start working 100% in the cloud. Even though I was already half doing this, moving over to permanent cloud-based working had been on my mind for some time and for many different reasons. I think I hadn’t done it before because I was a little apprehensive about committing fully to the process. I was worried it would be a complete faff and concerned that I might lose all my data. But now I have made the switch, I’m really happy with my decision. And although I still use my Asus laptop (I’m not going to throw it away! ), I could use my Chromebook for everything if I wanted to. So let me tell you how I work so you can see if it might suit your business as well. A Chromebook is a laptop that runs on Chrome OS instead of Windows or Mac OS. It’s just an operating system which means you can only use online applications and storage. Which is fine because when you think about it, pretty much everything a VA uses to run their business is online anyway. From email, storage (Dropbox and Google Drive) and documents and spreadsheets (Google Docs and MS Office); to social media, accounting software, video recording (Loom), image editing (Pixlr, Canva and PicMonkey) and project management (Asana and Trello), most of the tools a VA might use are accessed via the Internet. And the things listed above are only a few examples of the many online sites, apps and extensions that you might use for work; you’ll see loads more if you take look at your bookmarks bar. There are many reasons why a Chromebook is equal to (and sometimes better than) a regular laptop. Here are just a few of them. I love that if anything happens to my Chromebook, I can just log into my Google account on any laptop anywhere and continue working. I don’t have to worry about my data being lost and all I need to do is buy another Chromebook. If your laptop broke right this minute, do you have a contingency plan? I bought my Toshiba 2 Chromebook in 2016 from Amazon for £250. They can get quite expensive (over £1000 for a Google Pixelbook) but most of them are under £300 and you can buy a basic one for £120. The low price, security, and simplicity are reasons many people buy them for their children and older relatives, but this means they’re also affordable as a main or backup business laptop. These bad boys are completely secure because they automatically encrypt your files. You only need to make sure your Google account is secure – which is easy because Google has multi-layered login security options which you can find in your account settings. Chromebooks are so secure, Google will actually give $100,000 to anyone who can remotely hack one. Because a Chromebook is just an operating system, you don’t need antivirus software. They come with built-in malware and virus protection as standard and they have multiple layers of security. The virus protection automatically updates so you’ll always be using the latest and most secure version, and because Chrome runs all of their updates silently in the background, you’ll never sit twiddling your thumbs while your laptop goes through rounds of updates. The average battery life of a Chromebook is just over nine hours with continuous web surfing and some of them have a battery life of up to 17 hours. Although this does depend on the individual model, that’s pretty good going. The most important thing for a VA is being able to use Microsoft Office and you can now access this via an app in the Play Store. It isn’t available on all Chromebooks yet but it’s only a matter of time before it is. So you’ll need to buy a Chromebook that does have access to the Android apps, or you can check to see if your Chromebook already has access. But even if your machine doesn’t support the Android app yet, you can still use Microsoft Office Online which is the free cloud version. You can save documents in the various different Microsoft formats in Google Drive anyway, so you can still share your files with non-Chromebook users. Tons of business apps also work offline. 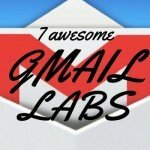 In addition, you can download Kindle books and PDFs, use Google Keep to write notes, manage your to-do list with Wunderlist and use Gmail, Google Docs, and MS Office offline too. Admittedly, this can be a bit of a ball-ache because you need to use a wireless printer and run the initial setup from a Windows laptop, but once you’ve done that you can print via Google Cloud from anywhere. Although I’ve removed bloatware and turned off all the apps that launch on startup, my Asus definitely takes much longer to get going. But because a Chromebook is just an operating system, you simply open the lid and away you go. Even though they’re mainly used to browse the web, Chromebooks also have internal disk space where you can store downloads. I usually save documents to Google Drive instead of internally but you can always free up a bit more space if you need to. You should use Google Drive for your file storage. You usually get 100 GB of free storage when you buy a Chromebook, but because this offer is only for a limited time, I pay £15.99 a year for 100 GB. I don’t even use half of that and I store everything there including all of my personal photos. You could use another online storage provider such as Dropbox, but you get much more free space with Drive (15 GB compared with 2 GB) and it’s also massively cheaper to upgrade and get more storage with Drive too. I personally keep all my own business files in Drive but I use both Drive and Dropbox to share client files depending on the client’s preference. My Chromebook weighs 2.95 lbs which is only a teeny bit heavier than my Asus. They feel the same weight when I pick them up but apparently, there’s a 0.30g difference! So they’re not heavy machines to lug around. I first tried using just my Chromebook when I went to the Middle East for two weeks and it was absolutely fine. The portability, cost and functionality of Chromebooks mean they’re a great option for Digital Nomads or any VA who travels a lot. Again, because they’re just an operating system and there isn’t much else going on, Chromebooks are extremely easy to use. Chromebooks work by using cloud printing and the set up is a bit of a hassle. But then it’s done. It takes a bit of brain reprogramming to get out of the habit of wanting to save everything to your desktop. But you adapt to saving everything in Google Drive very quickly, plus they do have a small amount of internal storage where you can keep files if you want to. Some Chromebooks only have a couple of USB2 or USB3 ports but you can easily get around that. Because I frequently use a wireless mouse and keyboard when using my monitor and I sometimes use a headset and external camera, I bought a cheap 4-port data hub so I could plug in more things if I need to. Text can be quite small because Chromebooks are usually small laptops, but I simply changed the default font size in the settings. I can also hook it up to my monitor with a cable like I do with my Asus. Because they have limited graphics processing power, Chromebooks aren’t as good as Windows laptops for playing the more graphically advanced computer games. A Chromebook isn’t compatible with every piece of software out there. So certain types of audio transcription software (such as one of the big players and most popular with VAs – Express Scribe) are only available via a Windows/Mac OS download. The same goes for diary management of certain Outlook Exchange accounts – some are not compatible so you will need to use the app. And if you’re a very creative VA who needs to use 3D editing tools such as Photoshop or professional video editing software, then you’re best off sticking with a Windows laptop. There are free photo editors available for Chrome OS, including Pixlr, which looks a lot like Photoshop, but those with existing files are out of luck because there isn’t currently an app that can edit Adobe’s .PSD files. A good way to decide if there’s anything you need to use that you can’t do with a Chromebook is to go to your laptop’s Downloads folder and take a look at what applications are in there. If you’ve downloaded an application, you really need it, and there isn’t an online version, then you should stick with your Windows laptop. But if there is an online version, you could use a Chromebook for the same job. But depending on what type of VA you are, most things can be accessed online and therefore a Chromebook would probably happily suffice. The only thing in my own Downloads folder that doesn’t have an online version is VideomakerFX which I used to make the animated video on my DIY VA course sales page. But I haven’t used it for years so it’s no big loss. Plus I still have my Asus laptop in addition to the Chromebook so I could access it if I needed to. In fact, I’m currently using both machines simultaneously. I keep the Chromebook in the living room and my Asus hooked up to my monitor in the office. Because I work in the cloud and they’re both synced, I just open either of them and continue what I was working on. You buy a Chromebook, open the lid, log into your Google account and start working. If you’re moving over from a Windows laptop or using a Chromebook in conjunction with your Windows laptop then you’ll need to save all your files in Google Drive first. You then decide which folders you want to continuously sync from your laptop to the cloud. Because you need a Google account to use a Chromebook, if you have no experience with Google products then you should probably stick to a Windows laptop. Google explains more about Chromebooks here. It used to be that Chromebooks didn’t work with that many Android applications, so they had limited functionality, and because these apps included MS Office, Photoshop and Skype, they weren’t really a viable option for a Virtual Assistant. But now that they do run these applications (and more apps are being added all the time) there isn’t much you can’t do with a Chromebook anymore. You just need to remember that a Chromebook is a Google laptop and not a Microsoft laptop so it doesn’t run Windows. So whilst I’m not saying you should immediately ditch your Windows laptop and move over to using a Chromebook, I do think it’s a good idea to do your research, know what you can and can’t do with them, look at your options, and then make an educated decision. But I think at the very least you should have some kind of back up for your main computer, so even if you don’t plan on using a Chromebook as your go-to machine, you should consider getting one in order to seamlessly continue your work if something happened to your main machine. Interesting read. I keep threatening to make the leap but haven’t quite managed it. The only thing I would add is get Office 365 as much better than the online version also allows you to download the equivalent apps and, depending on the plan, you get at least 1TB of storage so would not have to purchase anymore. I have read and reread this article a few times now, as I’m contemplating replacing my going-but-not-quite-gone laptop with one. Thank you for the inspiration!